The list of special equipment that I do have besides the things you might find in any European-style or American-style kitchen is not that long, but there are some items that I find are well worth having. Keep in mind that, as usual, I'm speaking from the perspective of someone who doesn't live in Japan. If I lived in Japan chances are I'd have a lot more Japanese cooking-only items, such as a square pan for making atsuyaki tamago (the thick, square slightly sweet omelette often served in sushi restaurants). I also use some substitutes for things that I can use for Japanese cooking methods as well as other cuisines, as you'll see. A good rice cooker. If you make rice, any kind of rice, more than once a week, you will never regret getting a rice cooker. [Update: a detailed look at rice cookers. A wooden rice container, or hangiri. It's tempting to use the "keep warm" feature of your rice cooker, but if you want the best tasting rice don't! Once rice is cooked, you need to fluff it up with a rice paddle, then ideally transfer it to a container that breathes - like a wooden hangiri or ohitsu. Mine is narrower and taller than the one pictured, which is meant for sushi rice, but it serves the same purpose. (Also I haven't been able to find an online source for the tall narrow kind of ohitsu so far...if you know of one please let me know.) If you are making sushi rice you must take the rice out and put it in a hangiri (see my Japanese rice primer). For mixing and scooping rice, you'll need a good rice paddle. Chances are you will get a free one with your rice cooker, otherwise a slightly curved one is handy. (The curved one is really handy for scooping up non-sticky grains, such as basmati rice). A carbon-steel wok. I know that a wok is Chinese in origin, but every Japanese household uses a wok extensively - for stir-frying tasks and for deep-frying too. There are oil-draining racks designed to fit around the perimeter of a wok. 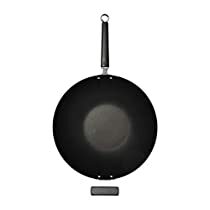 If you have an electric or induction range like I do, you must get a wok with a heavy, flat bottom - that stays flat. Several flat bamboo or water-resistant wicker baskets/sieves, or zaru. I haven't seen these offered online (so far) but you can often find them at Asian gift and food stores, and even in some department stores. Woven bamboo ones are the best since they are water-resistant and clean easily. These are used for serving things like cold noodles (soba, or buckwheat, cold udon, thin so-men, and so on). I also have some small ones which I use sometimes to make round-shaped tofu. There is a big difference between serving noodles in a plain old colander vs. on a nice bamboo zaru. A bamboo sushi rolling mat. If you make sushi rolls this is an essential tool. You can also use it for making other rolls (like flavored spinach wrapped in nori). Saibashi - long, uncoated wooden chopsticks, connected together with a piece of string. I have several pairs of these which I find essential for picking things up and turning them, stirring things around, and so on, If you're not used to handling chopsticks you may find a pair of tongs to be easier to manipulate. The following items are ones that are not Japanese, and which might not be used much in Japan, but I've found to be very good for Japanese cooking. A cast-iron stovetop grill pan. In Japan I might use an yakiami for grilling fish and shiitake mushrooms, but here I find a cast iron grill pan to do the job just as well. It also works great on an electric range (for an yakiami you need a gas flame). Enamelled cast-iron pans. There are a lot of Japanese dishes that involve gentle stewing, such as nikujaga (stewed meat and potatoes). There are also nabemono which are big pots of meat or fish and vegetables all cooked together. For these kinds of dishes, in Japan I might use an earthenware pot called a donabe, but here I find the heavy, enamelled cast-iron pots made by Le Creuset to be very useful, since they cook things very evenly. Since they are so pretty to look at I can use them for serving in-pot too. Finally, if you don't want to invest in a rice cooker, a cast-iron pot is the ideal container for cooking rice on the stove top. A sturdy metal strainer is useful for straining the bonito flakes out of your dashi stock and other tasks (the Japanese housewife might do this by adeptly picking it out with her saibashi, see above). A good, heavy frying pan or two. I use three frying pans: a stainless steel one and two non-stick ones. As you can see the list is not that long. The only other things you need are a couple of good knives. Knives are a whole topic unto themselves, so I'll leave that for another day. Besides the cooking equipment I have a variety of Japanese bowls and serving dishes I've accumulated over the years. If you're starting out on this road you can get a lot of very nice things from eBay these days. Jlist also carries many traditional and fun authentically-Japanese serving items. If you want to present a minimalist kind of plating though, just serve your Japanese food on plain white plates, and use plain white bowls for rice and soup. Don't forget to use chopsticks though! Submitted by maki on 2006-12-08 13:29. This is very useful. Thank you! Hey, this is great! My boyfriend is interesting in learning more about cooking in a wok and I'll pass this info on to him. Peace. Now for the long answer: If you don't plan to have a lot of parties and such where you need to cook for a crowd, then you probably only need a 1.5 gou, or up to a 3 gou (in case you do need to cook more rice at a time) capacity rice cooker. In any case, you need to specifically look for a cooker than can handle cooking 1 cup (1 gou) of rice at a time. Some of the bigger models can handle small quantities well (like the Zojirushi one I recommend) while others don't. Also, if you think you'll need to cook brown rice, you need to find a model that can handle different kinds of rices/cooking times. Unsurprisingly, it's all in Japanese which leaves me up a linguistic creek, but you might be able to order your zaru from one of them, eh? Hello, I see in your post that you said yakiami can be used on gas flame -- I have recently purchased one but from the instructions on the package (my japanese is terrible) it appears that using my tabletop gas burner is a no-no: Do you know why that is? If it's unuseable on a gas flame, then I wonder why I bought it since we have an outdoor charcoal grill that we use in nicer weather! hmm, I really can't say since I don't have the instructions :) If you can take a picture or scan it and put it up somewhere I can take a look if you like. Yakiami are made to use on gas flames since most Japanese households have gas ranges, so it can't be the gas flame itself that's a problem. I ordered it online so I hadn't seen the instructions till I unpacked it. Oops - I'm sorry, I forgot to reply to this! The instructions say - "this product is meant for city supplied gas and propane gas, so it is not suited for use with other heating elements." The next line: "This product may not work well with gas ranges with temperature sensors." Next line: "Do not use with cassette type gas cookers (the kind that you use a small can of gas). The gas can may explode, or the gas cooker surround may break." Next line: "This product cannot be used with halogen heating elements." Hello Maki san. I am looking for something to cook grilled fish recipes like sake no shio-yaki, hamachi-yaki, and such. I am interested in the cast iron grill pan, which you say cooks just as well as a yaki-ami, because it looks easier to clean. Which would you choose between a yaki-ami and a cast iron grill pan for sakana-yaki? Is it easy to turn over fish on a grill pan? Thank you so much! My choice of a grill pan is firstly made for me because I have a flat ceramic top electric cooking range - gas is impossible to get here in Switzerland. So for me, a yakiami simply wouldn't work properly. But as I wrote, a good cast iron grill pan does work just as well for fish, and it's quite easy to clean. Once the surface is well seasoned, things don't stick to it much so fish, etc. are easy to turn over. There's also the advantage that dripping oils and such from the food you're cooking don't get down to the heating element but stay in the pan. If you have a gas range, you could choose either. Your websites are so helpful Maki!! I'm still struggling with getting my sushi rice just right, but I've good results with a few of your bento components. Hi z, I forgot to answer this earlier! If your husband goes to one of the electronics stores in Akihabara (in Tokyo) that is used to dealing with foreigners, he'll be able to pick up a rice cooker modified for 220V usage. (This tip was posted a while ago by a JH reader, Peter from Wales). His hotel or for that matter any Japanese person should be able to point him in the way of Akihabara - it's the electronics mecca. I am interested in purchasing a tabletop barbecue that I think is called a tokoyo grill." It is made of cast iron, with the charcoal going in the bottom. On top is a solid, round cast iron plate which you cook the food on. There are about five little bowls incorporated on the top plate into which you put a sauce you can dip your food in and it stays warm. Does anyone have any ideas? I don't know anything about that particular grill...sounds interesting though. Good luck finding it! hello Maki san, i am trying to get hold of a tempura fryer with the dranage rack, as im not comfortable with using too much oil in a wok. can you give any advice? There really is no tempura fryer per se - most Japanese people use a wok with a drainage rack. If you are uncomfortable with a round-bottomed wok filled with oil, you can try to find a flat bottomed pan of some sort, or just use an electric fryer (not standard Japanese equipment but you can get it in North America and Europe easily. I've only seen industrial fryers in Japan). Requirement of Japanese Kitchen Equipoment for Industrial kitchen set up. Please give me details about Tappankayi equipments its top urgent we have a requirement for it. Please reply me soon if you that equipment with their specifications and prices. "Please give me details about Tappankayi equipments its top urgent we have a requirement for it. Please reply me soon if you that equipment with their specifications and prices." Thanks for this information. I'm going to get one of these ASAP. Thanks for the descriptions! I just bought a hangiri, and I'm wondering...what's the best way to wash it? I'm a little worried because it's so pretty, and I don't want sticky rice grains to be glued to it, but I don't want to scratch it up with a hard sponge or anything. is there a good method for washing hangiri? You should wash a hangiri with a soft sponge and water, using mild dishwashing detergent if necessary. If there's rice stuck to it, just soak it for a bit and it will come off. Remember to air dry it completely before putting it away. Hi, just need to ask on how to use the yakiami. I have just bought one and I wanted to know how to use it properly. Also, how to clean. The yakiami I have is a rectangular pan with removable grill and a foldable handle, and a ceramic screen plate. Thanks! Despite this being a post from rather long ago, I would like to also know the reply to this question! As I crawled across the web, there seems to be endless pages trying to see me a yakiami, and the usage information is very sketchy. I used one that I bought from DAISO (and i was punished for being cheap. -_-||| ) and gosh! It seems got very messy and most of the fish was stuck to the grill! "How to use a yakiami" is on my tremendously long list of things to write about, but briefly to use one, you need to let it heat up thoroughly so that the ami (net) part is really hot before putting stuff on it. Also fish needs to be thoroughly wiped dry. Whole fish like mackerel should be lightly salted to draw out excess moisture an hour+ before, then patted dry. Things like mochi should be ok, provided the ami is really hot when you put them on. Marinated fish etc. should be cooked on a piece of aluminum foil that's on top of the ami. All that being said, I must say that I prefer a grill pan myself...much easier to clean! 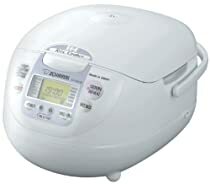 I miss my Japanese rice cooker so much, I am willing to buy one. I still have friends in Japan that can send me one, but I would like to know if there is any specific model that is dual voltage, not only 240v as akihabra models for tourists, my friends doesn't live in Tokyo and I will probably leave next year to a 120v country, so a dual voltage feature will be really useful.